FoodieMommy: Summertime at Davis Farmland Means Waterplay! It was sweltering today in Metrowest Boston. Absent central air, and wanting to have an adventure with my children, I decided to take the plunge. My 4 year old (who was 2 1/2 at the time) had wonderful memories of the Davis Farmland in Sterling, Mass. Essentially an enormous petting zoo, he loved feeding the animals and putting on "make-up" (face paint!) And my other son, now 2, had no memories of it whatsoever. Now, friends thought my idea was a bit, well, crazy on a 100 degree day. But I was determined to go, sure that once they saw the cute little goats and piggies and kittens and pot-bellied pig and furry sheep, my toddlers would forget about the heat. Um-NO! It was incredibly hot in the sun and we all quickly melted. But we tucked into each shady corner and fed the provided feed to the animals, while having lively conversations about udders and horns and curly tails. My boys had a chance to milk a live goat (! ), to touch a chick and a newborn cow, while I thought fondly of Wilbur as I patted a baby pig. Once again I was struck by the quality of the workers, mostly older teenagers who seemed so happy to be answering questions, showing off the animals and working with visitors. 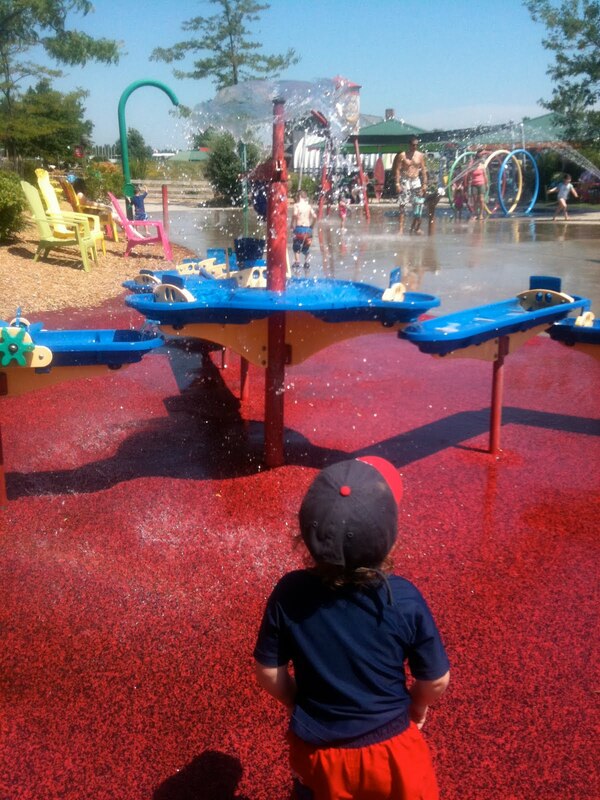 But the best was really our destination: the Davis Sprinkler Park, included as part of your entrance fee. We had last come in the fall when the sprinkler park was closed and let me tell you, it was so fabulous today. Full of a range of sprinklers, it was as good for the hesitant and fearful 4 year old as the puddle jumping two year old. My 4 year old stayed put creating dams and rivers on one structure, while the two year old went from a sprinkler/fire engine, to a big bubble bath to a series of waterfalls. Content parents either let their children soak them with water (like me) or stayed surprisingly cool in the tented areas on the edges. We took breaks to indulge in grilled cheese and hot dogs, but thankfully, Davis also lets you bring your own snakes, like frozen grapes and frozen apple juice packs and granola bars. Davis isn't cheap, even with a discount card. But for today, it was completely worth it. The day ended on a sweet note. We discovered the "Rota-Spring" Farm, minutes from Davis. There we indulged in homemade ice cream, while we stocked up on grass fed, local beef and freshly picked blueberries. As we drove away, my children sank into perfect naps, faces-painted and all.